A good diet is essential to keep your cat healthy and I also want to ensure your cat enjoys the food. 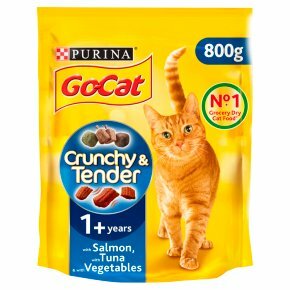 Go-Cat® Crunchy & Tender is a 100% complete, balanced pet food and it offers two different textures for your cat’s enjoyment at mealtimes. It contains: -Crunchy kibbles to help maintain healthy teeth and gums. -And some softer, more tender kibbles that provide extra nutrition to your cat. They are richer in meat, proteins and Vitamin D which help maintain muscle tone and strong bones. Go-Cat® Crunchy & Tender provides your cat with all the essential nutrients, vitamins and minerals needed to stay healthy and live life to the full! No Added Artificial Colours, Flavourings or Preservatives. Offers two different textures / Some softer, more tender kibbles. 100% Complete & Balanced. Healthy Teeth and gums: Crunchy Kibbles to help maintain healthy teeth and gums. Toned Muscles and strong bones: Some softer, more tender kibbles that provide extra nutrition to your cat. They are richer in proteins and Vitamin D which help maintain muscle tone and strong bones. Our cats are natural explorers, alive to everything in their world. A good diet is essential to nourish your explorer's free natural love of discovery. And you want to ensure your cat enjoys the food he eats. That's why Purina® Experts have created Go-Cat® Crunchy & Tender: a 100% complete and balanced, delicious cat food that offers two different textures for your cat's enjoyment at mealtimes. Go-Cat® Crunchy & Tender provides your cat with all the essential nutrients, vitamins and minerals he needs to help your little adventurer stay healthy and live a life full of discovery. Go-Cat® has been feeding cats with good, wholesome nutrition for decades. We fill millions of bowls and this honour comes with great responsibility. It's up to us to make sure all cats who eat delicious Go-Cat® get the healthy food they need? That's why Go-Cat® recipes are made with no added artificial colours, flavourings or preservatives. So you can keep feeding them the same tasty food they love and feel proud about it. Feeding Guide: Daily Feeding 3kg - 50g 4kg - 70g 5kg - 90g Fresh, clean drinking water should always be available. Sufficient consumption of water is a necessary part of health, every day nutrition. The adult maintenance averages are based on moderately active cats at normal environmental temperatures. Individual needs vary and feeding should be adjusted as required to maintain your cat at a lean, healthy body weight. This is not a toy.<br>To avoid risk of suffocation, keep out of reach of children and pets.